Robert H. Schuller, who preached a theology of self-esteem in an effort to communicate the Christian message to modern Americans, has died at 88. Schuller was pastor of the Crystal Cathedral, a glittering, all-glass monument of a megachurch. Schuller was one of the country's most successful televangelists, with his show Hour of Power broadcast to millions weekly. While some conservative Christians were skeptical of Schuller's upbeat message of positive affirmations, he insisted the theology of self-esteem was evangelical. "Something is terribly wrong in the area of theology today, because people aren't responding to the gospel as they should," Schuller told Christianity Today in the mid 1980s. "If they're dying, and they are; and going to hell, and they are; and we have the best thing in the world, and it's free; then why aren't they flocking in?" The problem, according to Schuller, was communication. Americans were emotionally hungry, but didn't respond to insensitive condemnations or huffy proclamations about sin. Traditional formulations of the Christian message weren't effective. Schuller, on the other hand, had a congregation of 10,000 in the mid-1980s and a viewership estimated at 2.7 million. If he was anything, he was an effective communicator. "Turn your scars into stars"
"What you can conceive, you can achieve"
"Inch by inch, anything's a cinch"
"It takes guts to leave the ruts"
"Don't take care, take charge"
"Tough times don't last, tough people do"
"Our job," Schuller said, "is to figure out how to present the living Christ in a way that people will effectively meet him." Ordained in the Reformed Church of America, a Dutch Calvinist tradition, Schuller moved from Michigan to Southern California in 1955. The region was booming in the postwar economy, and seen as the embodiment of America's future. Schuller went there to establish a church that would attract non-churchgoers, an idea that would later become widely embraced by American evangelicals as a "seeker sensitive" model of church growth. Schuller preaches at a drive-in movie theater in the 1950s. Schuller rang 500 doorbells in Southern California. He asked 500 people, "Why don't you go to church?" He read The Power of Positive Thinking, the best-selling book of Norman Vincent Peale, another minister in the Reformed Church of America, and decided to focus his ministry on the positive results of faith. Then he started holding services at a drive-in movie theater off the Santa Ana Freeway in Orange County. He advertised it in a local paper with a catchy slogan: "Worship as you are," the ad said, "in the family car." Preaching from atop the refreshment stand, Schuller's first sermon was about how all things are possible with God. His wife, Avrella Schuller, played hymns on the family's organ, hauled to the site in a trailer every Sunday. One woman who was there in those early days was Doris Carlton, of Anaheim Hills. The now-89-year-old woman told the Orange County Register that hearing the message on the drive-in speaker in her own car made it somehow more personal. "I liked being outside, enjoying the weather, listening directly in the car; like it was a personal message just for me," she said. "I liked the camaraderie between the cars. We never became acquaintances, but we'd wave at each other. And instead of saying 'amen,' we honked." Schuller convinced Peale to preach at the church in 1957 -- inviting him without mentioning the church was actually a drive-in. The best-selling author nonetheless gamely climbed the ladder that was also the base of a 15-foot cross and got on the pulpit that was also a hotdog stand, and talked about positive thinking. So many people came, some had to park on the side of the freeway and walk in to the theater. By the 1960s, Schuller had replaced the drive-in theater with a church designed by the modernist architect Richard Neutra. The new church seated 1,700. There were also large sliding glass doors that opened to a drive-in lot, where thousands more could hear him in the intimacy of their own cars. There was a 14-story office tower on top of the church, and a 90-foot neon cross on top of that. It was visible from Disneyland, a mile and a half away. By the 1970s, on advice from Billy Graham, Schuller started his weekly television show, Hour of Power. Within a decade it was airing on 190 TV stations, at an annual cost of $8 million. The L.A. Times reported that Schuller's show, produced by his wife, was "the slickest, most professional religious program on the Sunday airwaves," and one of the most watched. 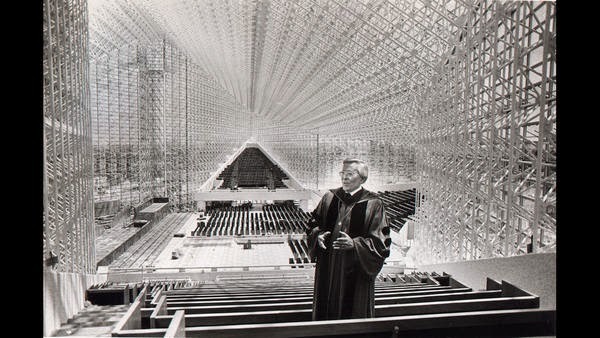 In 1980, Schuller opened the Crystal Cathedral, designed by another famous modernist architect, Philip Johnson. It was made of more than 10,000 panes of glass, and it was 207 feet wide, 415 feet long and 128 feet tall. It had room for more worshipers than the previous church, plus one of the largest organs in the world and space for a choir of 1,000. The church was a massive stage for Hour of Power, complete with a dozen shooting water fountains and two 90-foot doors Schuller could open with a button from his pulpit. The Crystal Cathedral became iconic, a symbol of "possibility thinking" and the success of self-help-style Christianity in 20th century America. The whole thing was "pitched perfectly to the same upper-middle-class white audiences who would fall in love with the affable Ronald Reagan," writes Tim Stafford, an editor at Christianity Today. "It was self-help optimism in the name of Jesus." 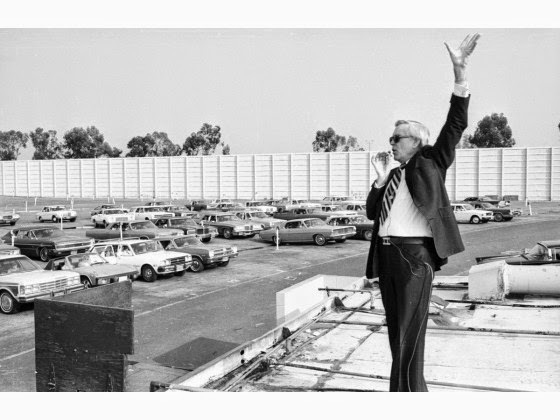 By the time the Crystal Cathedral opened, Schuller was a bona fide celebrity. He was so famous that when Queen Elizabeth came to Los Angeles in the 1980s, Schuller was one of the few people she invited to lunch. When he met Muhammed Ali at the lunch, Ali asked for his autograph. Robert Schuller in the Crystal Cathedral. Unlike many other famous televangelists of the era, Schuller's ministry was free from financial and sexual scandals. Long after other televangelist disappeared into infamy, he continued, preaching self esteem. Schuller's ministry empire still collapsed in the last years of his life, though. After he stepped down as pastor of Crystal Cathedral in 2006, there was a struggle for succession. His son, at one point, was removed from leadership and replaced with his daughter. Some in the church sought to push all Schullers out of leadership. The church suffered serious financial hardship at the time, for reasons that are disputed. Crystal Cathedral was forced to file for bankruptcy in 2010, with more than 550 creditors owed more than $50. Schuller was removed from the board the following year. In 2012, the iconic megachurch was sold to the Catholic Diocese of Orange County and the remaining congregation of about 200 people was forced to move. Schuller sued his church in for breach of contract and copyright infringement, claiming he was owed millions. He lost the suit, appealed and lost again. The Supreme Court declined to hear the case three days before he died. Schuller's church and television program is now run by his grandson, Bobby Schuller. In some ways, the younger Schuller is carrying on the family tradition. He believes in innovating, adapting church to the culture, and talks about the need to communicate with modern Americans. He has written two books, both about how to be happy. He says the core of his ministry, like his grandfathers, is about believing the impossible is possible" and "allowing your hopes to shape your future, not your fears." Yet the younger Schuller also obliquely critiques his grandfather. He tells the LA Times that his goal is "to make big Christians, not big churches." In in interview with the evangelical World Magazine, he said the Crystal Cathedral sometimes inhibited ministry rather than facilitating it. "At some point, it's almost like a double-edged sword," Bobby Schuller said. "It draws people. It gives you gravitas as a pastor. It also can be a distraction, I think, for people, where the real value can be put in the building rather than in your faith." Like his grandfather, he wants his work, he says, to be "people oriented." But he also worries that can be a slippery slope. "I think one of the big dangers is in the goal of being missional," Bobby Schuller said. "That's usually where it begins is the goal being missional, reaching people right where they're at. Sometimes we slip on our principles, whatever they are, and I think that's constantly a danger." Robert Schuller dismissed concerns about cultural adaptation going to far. But that was a different time. The elder Schuller, in his seminars on church leadership, focused almost exclusively on practical matters. "Conduct a marketing survey and appeal to the people in your own backyard," he said. "Provide plenty of parking space." Schuller was diagnosed with esophageal cancer in 2013, and stopped chemo treatments after his wife died at 84 last year. He died on Thursday, April 2.